Dicentra is a sort of mainly perennial plants belonging to the family of Fumariaceae, and numbering about 20 types. A habitat of wild-growing representatives of this sort is America and Asia. Dicentra has a set of names, the majority of them are connected with external features of flowers which are similar to small hearts. 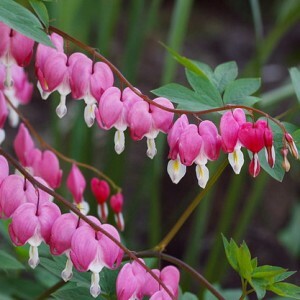 So, the Russian-speaking population calls Dicentra "the broken heart", French use the name "Zhannetta's heart" more often, Germans – "a heart flower", and in America in this flower see "the bleeding profusely heart". British depart from romantic subject a little and quite often "the Chinese's trousers", "the Dutch shorts", "locks and keys" or "flower lira" call Dicentra. The scientific name also reflects uniqueness of flowers: the combination of the Greek words "di" and "kentron" is translated as "dvushporets". Bleeding heart. Bleeding heart varitety. Bleeding heart cultivation.